Did you miss me? I decided to take January off from blogging as so many other things were going on. Maybe more on that later! ...... But I'm back now - and one year older!! It was my birthday yesterday and I feel just as young as I did on Saturday - so that's good! Here's a good breakfast cereal for you to try and see if it keeps you feeling as young as me! Its made from buckwheat. Little tiny pyramids - as you can see above. Buckwheat isn't actually a grain but rather a seed and is in the same family of plants as rhubarb. 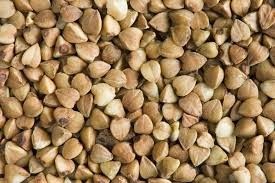 It is a useful crop to grow as it has a short growing period, producing seeds at around 6 weeks which ripen at 10 - 11 weeks. So its great as a fill-in crop, between other crops. It has reasonably high protein levels (approx 18%) including all the essential amino acids. It is also rich in iron, zinc and selenium, and rutin. Rutin is a bioflavonoid that helps strengthen our blood vessels so it particularly useful for varicose veins, hemorrhoids etc and may lower blood pressure. In this recipe, I've used raw buckwheat. You can generally buy it either raw or toasted. When it is toasted, it's often called Kasha. You can also buy it as a flour...and you may have tried it in buckwheat pancakes for an example. I like the crunch, texture and chew of it in the cereal. You can obviously change up this recipe to use ingredients you like best, so this is just a canvas recipe -that you can adjust to your own particular tastes. For example, I didn't have sunflower seeds or pumpkin seeds one time, so subbed 1 cup of walnuts instead. Mix all the ingredients and you are done! As simple as that. I don't think it needs any oil or sweetener - just pour some non dairy milk/yoghurt on top and add some fruit, which will sweeten it - and enjoy. Vegan, free from added sugar, gluten, oil, and good source of omega fats. Good source of fiber. After my success with making oat yogurt, I thought I'd try my hand at almond yoghurt. I've tried it before on a few occasions, but it wasn't successful. The previous methods were using a yogurt starter, specifically for non-dairy products, and a yogurt maker. But this time I thought I'd just adapt the oat method and use almonds instead. It produced a delicious creamy yogurt - that just looks like cream. I fermented it for 12 hours on the back of my range - so a reasonably warm spot and the sourness was as I like it after that time. After refrigerating, the yogurt thickened up and is a perfect accompaniment to my homemade muesli. Yoghurt-in-progress - on the back of my range, keeping warm. The only ingredients in the yogurt are almonds, water and probiotics. If you look at the labels of bought almond yogurts, they frequently have many chemicals included plus lots of sugar. I don't think this needs any sugar. At my class yesterday, I let my students taste both the almond and oat yogurt. They preferred the almond - and considered it tastier than any bought non-dairy yogurt. My previous attempts all resulted in gritty yogurt, which separated a lot and gave more water than yogurt. This has none of those issues and doesn't even need stirring before use in the morning. Oats are now quite famous for their health benefits and have grown in popularity. Unlike other grains, although oats are hulled, this process does not strip away their bran and germ which allows them to remain a concentrated source of fiber and nutrients. Different types of processing techniques are used to produce different oat products. oat groats - this week I've been trying recipes using whole kernel oats - also called oat groats or oat berries. 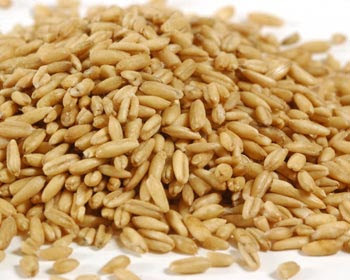 They look similar to a grain of brown rice (see photo below). steel cut oats - produced by running oat groats through steel blades to slice them , creating a denser chewier texture. old fashioned rolled oats - these oats are steamed and then rolled to have a flatter shape. 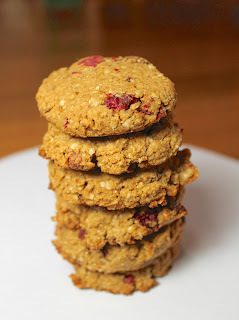 quick cook oats - similar to old fashioned but these are steamed and then cut finely and then rolled. instant oatmeal - these oats are partially cooked rather than just steamed and then rolled very thinly. Often salt, sugar or other ingredients is added. oat bran - the outer layer of the grain. oat flour - made from the hulled oats. Oats are a very good source of the minerals manganese, selenium, and phosphorus. They are also a good source of magnesium and iron and heart protective polyunsaturated fats. Oats have more than three times as much magnesium as calcium and are a good source of vitamin B1 and soluble dietary fiber. Oat bran's dietary fiber is high in beta-glucans, which helps to lower cholesterol by binding bile acids and removing them from the body via feces. In individuals with high cholesterol (above 220mg/dl) the consumption of 3 grams of soluble oat fiber per day (1 bowl for breakfast) typically lowers total cholesterol by 8 - 23 %. This is highly significant as with every 1 percent drop in cholesterol, there is a 2 percent decrease in the risk of developing heart disease. The polyunsaturated fats in oats actually contribute as much to its cholesterol lowering effects as the fiber does. Oats also have beneficial effects on blood sugar as well so are a good food for diabetics to consume. Oats are also good for the skin. Four tablespoons tied into a muslin bag, soaked in the bath and used as a sponge are healing and soothing for dry skin, eczema and psoriasis. This amount is enough for 4 or 5 baths. You can also buy oat based creams and ointments for topical applications. Mix the ingredients together in an air tight container and use 1/2 cup per serving, with non-dairy milk or yoghurt and fruit and nuts. I'll be sharing some recipes using whole kernel oats soon. If you do have celiac disease or gluten intolerance, make sure you purchase gluten free oats.